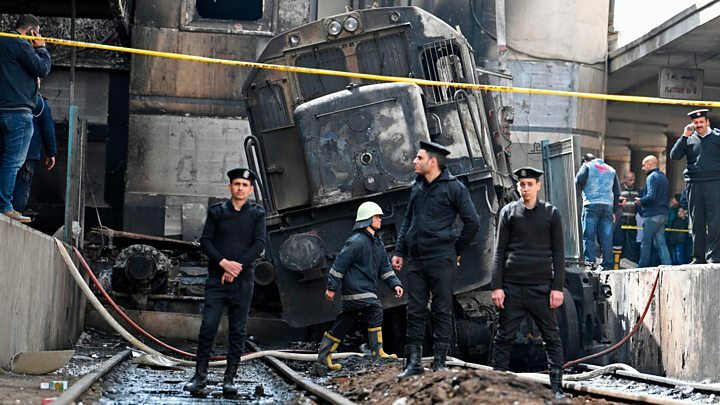 At least 20 people have been killed and 40 injured after a train crash sparked a large fire at Cairo's main railway station, Egyptian officials say. State-run media earlier reported a higher death toll of at least 25 and as many as 50 injured. "I saw a man pointing from the locomotive as it entered the platform, and screaming 'There are no brakes! There are no brakes! ', before he jumped out of the locomotive," witness Ibrahim Hussein told Reuters news agency. "I removed nearly 20 bodies, and carried them to the ambulance, all of them completely burned," Ahmed Mahmoud told news agency AFP. "[The train] should have slowed down as it was about to enter the station, but it came in too fast." The privately owned news website al-Shorouk cited a source as saying the train had been undergoing maintenance when it started moving at speed towards the station's main building without a conductor. The source added that this was not the first incident of its kind, explaining that there had been two other cases of a train moving without a conductor that had not resulted in any deaths or injuries.